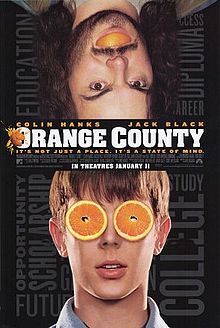 Shaun (Colin Hanks) is a kid who has grown up in surf heaven Orange County. His parents are divorced and his ultra rich father, Bud (John Lithgow) lives with a young gold digger and their nightmare child. The mother has remarried and her husband is in a wheelchair and out of his mind. Then there is the brother, Lance (Jack Black), who is constantly high or recovering from partying. Shaun decides he wants to go to college and become a writer, and feels like everything in his life, his surfer buddies, his family, his incompetent school (with the wonderful Chevy Chase and Lily Tomlin), everything. Oh, no, his girlfriend Ashley (Schuyler Fisk) is on his side. This is one of those films that I remember coming out and thinking it was a bit of a Porky’s or one of those other ridiculous stupid teen films. So, the other day I felt like watching a ridiculous stupid teen film and got this. And guess what? It’s not. But it’s not really good either. It’s really boring, quite predictable, and things just don’t quite gel. It’s like they have Shaun and Ashley as believable, normal characters and everyone else in the film is a parody, and it just doesn’t work. At all.